Heroes, Heroines, and History: Shipwrecked Cars? The Eagle Harbor Coast Guard rounded Keweenaw Point, returning from rescuing 22 men from a shipwreck. 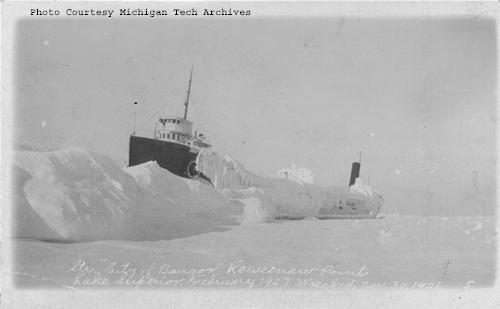 Ahead of them appeared a ship stranded in ice, also a victim of a Lake Superior winter storm, yet the vessel appeared to be abandoned. Where was the crew? As they continued on, the Coast Guard saw the desperate men from the ship, the City of Bangor, standing on the icy shore. Shouting to the men a promise to return for them, they deposited the first group of rescued men safely in Copper Harbor, then went back and fought the blizzard’s icy waves to reach the 29 weak and exhausted mariners. Many of the men suffered from frostbite and exposure after spending a cold night on the snow without food or adequate clothing. Bound for Duluth from Detroit, their ship hit the rocks the previous day, ripping the hull open and pouring water into the engine room. As icy spray from the lake froze over the steel ship, it became a cold, dark iceberg. The crew had to wait until the next day for the seas to calm enough to launch a lifeboat. However, no help awaited them nearby, as the area was devoid of houses, people or roads. They built fires, and the ship’s officers kept the men moving to prevent them from freezing to death in the subzero temperatures.The Coast Guard rescued them just in time to save their lives, yet many required hospitalization. But what about the 248 brand new 1926 Chryslers that were the ship’s cargo? Were they lost to the sea? At least eighteen cars had been blown off the deck by the fierce winds. But most of the cars in the ship’s hold were still in excellent condition. But how could the cars be retrieved? Drive them off, of course. How, you ask? Wait until the lake freezes over. And that’s what happened. When the water surrounding the ship froze solid enough, a ramp of snow and ice was built to the deck. One by one, the Chryslers were driven off and over the ice to Copper Harbor. They remained there until spring when the roads could be plowed open. 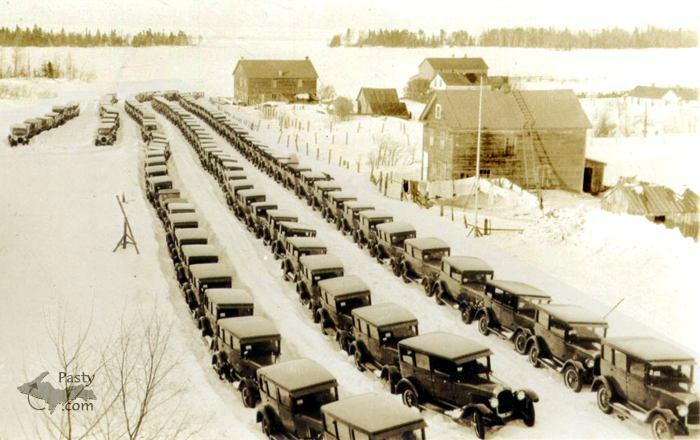 Then the cars were driven to Calumet where they were loaded on a train, shipped to Detroit, repaired, and sold. 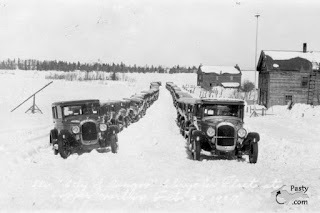 Several Chryslers did remain in the Copper Harbor area where their proud owners swore they were the "finest cars they ever owned." What an interesting piece of history. Wouldn't that have been a site to see when those men drove the cars off the ice. I live in OK, and we never have ice freeze hard enough to walk on. Vickie, I, too, as a southerner, also find it very hard to believe. Notice I didn't put any bio info on the post. I've been traveling for seven weeks, found the story while on our trip, and wanted to share it on HHH, but forgot to add the bio part. Wow! What a fun post, Marilyn! I never heard that story. 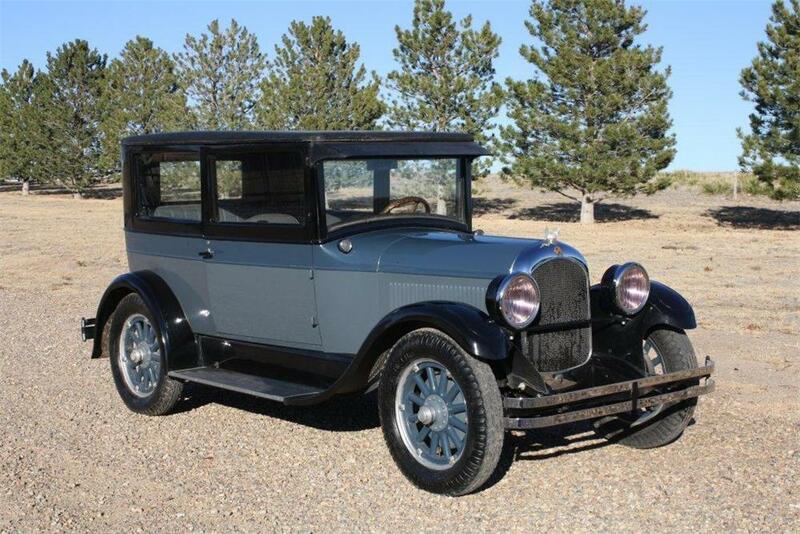 Such an interesting part of the automobile history. And awesome pictures!! Debbie, I thought the story was pretty amazing too. Saw the info in a museum we visited during our vacation. Cool info. Just a matter to time and cold to get the cars off. That those cars were the "finest cars they ever owned" speaks well for Chrysler after the cars had such a rough beginning, being left out in the cold. Oh, how interesting! I love the pictures! Thanks so much for sharing this historical tidbit, Marilyn. Fascinating article, Marilyn. Thank you.